I think it was Smoke Gets In Your Eyes where I first learned about Victorian post-mortem photography, but I thought about it again while reading How To Be a Victorian. Then recently, The Bloggess recommended this book which I immediately requested through interlibrary loan because it's not available in my network (but soon will be, because my library is sure as hell buying it now.) 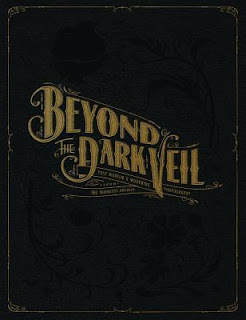 Beyond the Veil is, as the subtitle suggests, a collection of post-mortem and mourning photography, primarily from the Victorian era as that's when this sort of thing was all the rage. The book is primarily made up of photos with captions, but there is also some text about the photography and the context. The font was small and the content was rather scholarly in tone and I read it, but my experience is much more about the photos that made up the bulk of the book. The first section is "Pre-mortem - Deathbed" photos, primarily of young women who evoke the very essence of dramatic Victorian novels. One of them looks disturbingly like a librarian I know. Next, the largest section, is "Children and Family" which is mostly photos of dead babies and young children. This is followed by "Adults," "Crime - Murder - Tragedy," "Ephemera and Mourning," and "Pets." I have to say that pictures of dead dogs and cats are rather a letdown after babies and murder victims. In some of the photos, the deceased are arranged in coffins; in others they are arranged in bed in a restful pose, or even upright in chairs. Sometimes their eyes are open, and sometimes they are closed. In a couple of especially creepy photos, the eyes are partially open. Occasionally it is necessary to arrange the body to hide the site of an injury, though in at least one photo the child's face is visible and obviously had received great trauma. One of the most interesting photos is of a small family, a husband and wife and their child. The woman, suspecting her husband of an affair, shot him before killing their child and herself. They are all arranged nestled together in a casket where they arere destined to spent eternity together after this horrible betrayal. Another is of eight caskets laid out side by side, the result of a mass murder of a family and their chore boy. The caskets are surrounded by many friends and neighbors. At the time of the photo the killer had not been caught. It turns out that he was in the photo. These arere both so haunting and creepy that I want someone to write novels about them. Noticeably absent is any explanation of the Thanatos Archive. The first time I tried to look them up, their website wasn't really working, but now I see that you can pay for an online membership to get access to their entire archive of photos. Or you can just follow them on social media, which is what I'll do. I still don't know anything about who they are or why they started collecting these photos, but I'm glad they did. If you're wondering why any of this even exists, just think back to conditions in the Victorian era. First of all, people were more in touch with death than we are today because it visited their families so frequently and mercilessly and there wasn't yet a funeral industry like we have today. At the time, bodies weren't just whisked away immediately to be hidden from view, and only presented when they were carefully reconstructed and preserved. Everyone knew what a dead person actually looked like. But more importantly, photography was rather new and sometimes people died before there was ever a photograph taken of them - this was the family's only chance to capture their image before they were gone forever. It makes a kind of sense. Obviously this is right up my alley. Apparently I'm not the only one, because when it came in for me I had to promise to let other people in my department at work see it before it was sent back. Part of the appeal is definitely the macabre aspect, I suppose, but it's also a fascinating part of history. I should also mention that the cover and binding are of high quality, and the pages are gilt-edged. It's really an altogether beautiful book.